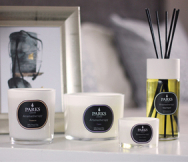 Infuse your space with captivating fragrance with this limited edition No.7 Cotton Fresh Exclusive Gift Set from Parks. Featuring an elegant votive candle and luxury perfume diffuser, this inspiring set has the power to transform your home with its exotic medley of Polynesian orchid, tropical lotus flower and cherished hibiscus - providing pure and long-lasting fragrance in every room. Crafted by our skilled perfumers, the No. 7 Cotton Fresh fragrance in the Parks Exclusive collection contains a blend of highly prized scents, helping you to set a refined and unique tone throughout your home. We've selected scents that are renowned for their freshness, creating a spirit-lifting fragrance reminiscent of freshly washed cotton blowing in the warm summer breeze. First comes the scent of Polynesian orchid, whose spicy, vanilla-come-cinnamon scent provides the perfect base note for a refined and complex floral medley. To this we've added tropical lotus flower for its light oriental fruitiness, and hibiscus, whose subtle notes of berry and green tea help to refine and complete the blend. For a limited time, we're offering our No.7 Cotton Fresh fragrance as part of an exclusive luxury gift set. Beautifully packaged in a presentation gift box, the set includes a 235g natural pure wax candle and 200ml perfume diffuser, complete with natural rattan sticks for weeks of long-lasting fragrance. Together, the candle and the diffuser deliver a bold and enduring fragrance that will help fill your entire home with the pure and uplifting scent of fresh cotton, lotus flower and orchid.